This question was asked by one of my readers as part of the DWD etiquette Q&A series. I am creating a friend’s Save-the-Date and Invitations for their destination wedding. They are only inviting close friends and family to their destination wedding in Jamaica but are also having a wedding back home for everyone. Everyone who is invited to the wedding is invited to the at-home reception however, not everyone who is invited to the home celebration is invited to the destination wedding. How do they go about deciphering the two with the save the dates and invitations? They are thinking they need to send out a save the date for the people coming to the wedding and a second one for the location back here. What is the best way to go about this for the save the dates? How do they keep things separate with still letting people know what they need to know and who is actually invited to what? Then there is the whole other issue of the invitations? I don’t even know where to start with those, but luckily I do have time to help them with that. If someone who’s not invited to the Jamaica wedding gets wind that your friend is getting married but they didn’t get a save-the-date or invitation in the mail, they could get upset thinking that they’re not invited to the wedding at all. But if they get a save-the-date to the home reception, then they’ll know it’s the destination wedding they’re not invited to, which in most cases is perfectly understandable since destination weddings tend to be more intimate in nature with family and close friends. The way to keep things separate is with the wording. Now the invitations are a different story but a little easier because people would have already received save-the-dates so they’ll know what to expect. Invitations for the at-home reception can be sent out 6-8 weeks prior just like you would for a traditional wedding. For those guests who are invited to both events, you can include the invitation to the at-home reception with your destination wedding invitations. Again, you will word them differently to keep things separate and avoid confusing guests. 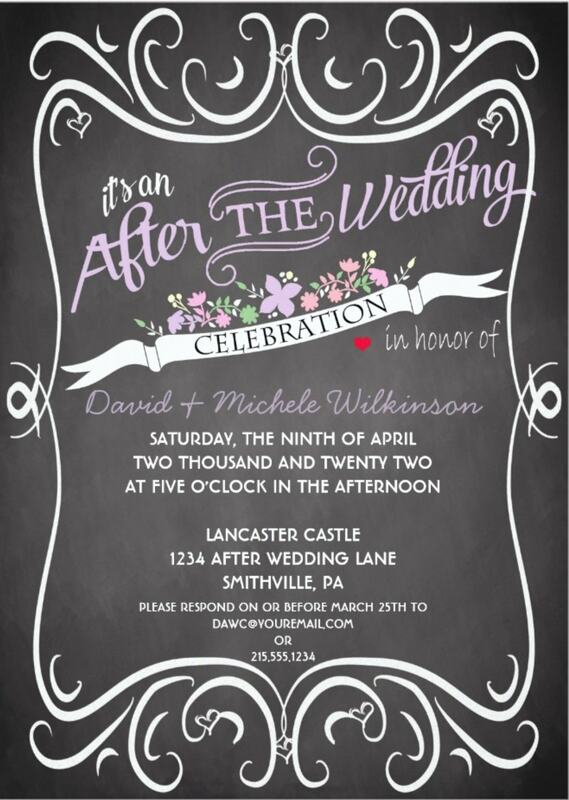 Here is a great example of a post-wedding reception invitation, which is sold by one of my affiliates (disclosure, I will make a small commission if you purchase this invitation at no additional cost to you – it’s just one of the ways we keep this site running). For more ideas, check out this post with 21 at-home reception invitations featuring unique designs and wording. I hope this helps! Best of luck. Are there any wedding website templates that provide the ability to separate the invitations for the foreign vs domestic events? Or should one just set up the website for the larger event, and do the destination event more traditionally? Hi Jenn – Yes Appy Couple is amazing for this. It’s a great wedding website and app that’s super easy to use and has a ton of cool features. But one of my favorite features is that you can create different event invitations and segment the guest list per event. 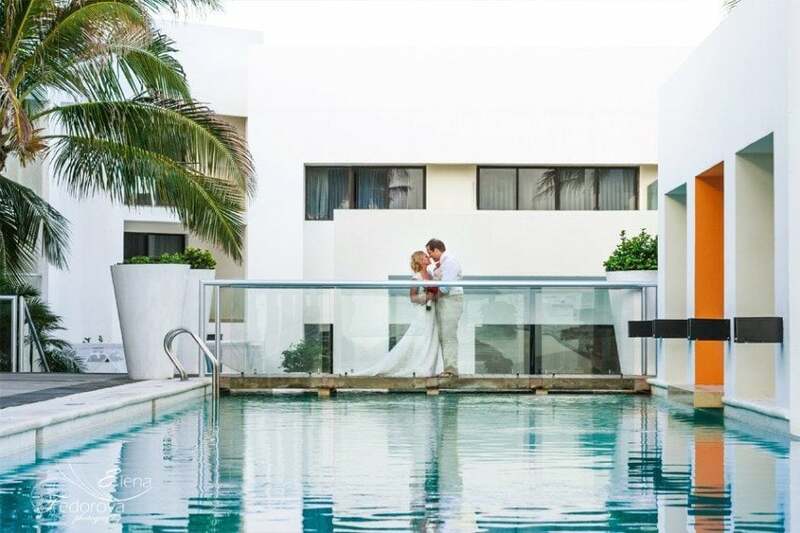 You can invite one group to the destination wedding and set up privacy settings so that only those people will see information pertaining to the destination wedding. If you invite another group to the domestic events, you can set it up so that they’ll only see info for that event. It’s up to you who sees what, so it’s pretty cool. This is GREAT help. Thank you for spending the time to respond to me, I greatly appreciate it!